Are you searching for a dentist for your little ones? We can help! Finding a dentist who specializes in caring for children can be a challenge. The great news is that at Summit Family Dentistry, we proudly offer pediatric dentistry services, ensuring that even your little ones can get the dental care they require. We know just how tough it can be to get your kids started creating positive dental habits early and that’s what we’re here to help with. It can be quite the experience for children to visit the dentist, but we happily provide movies for them to watch, iPads to play with, and much more. 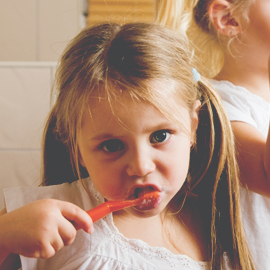 At the end of the day, our goal is to help your kids get used to making a trip to the dentist. Learn more about what you can expect from your child’s visit below, or contact us today to schedule an appointment! At Summit Family Dentistry, we aim to serve everyone, including your children! We understand how busy life gets and how hard it can be running around to different dentists’ offices. We love kids and want to be able to accommodate your entire family. We will work with you to see your children and ensure they are well cared for. Although the point at which your child’s first dental visit takes place is up to you, Dr. Pernell recommends children be seen at either their first birthday or the eruption of their first tooth. The sooner you expose your children to proper oral care, the more likely they are to have excellent oral health and habits as they age. It is important that children become used to visiting the dentist early on. Not only is this important for their oral health, but it instills positive routines and decreases their fear of going to the dentist. We understand that the dentist can be scary. 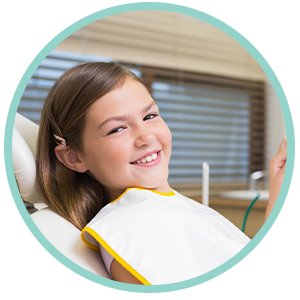 To make your child more relaxed, we have movies for them to watch, iPads to play on, and we offer the option of nitrous oxide to help them relax when necessary. All patients that are under the age of 18 will have to have a parent or guardian present at their appointment. You may be asked to fill out additional paperwork in the office upon arrival for their procedure. Start healthy habits early, and let Summit Family Dentistry provide you and your children with a dental experience the whole family will love. Contact us today!